In a world of quick fixes and instant gratification, children with entitlement issues are everywhere – making demands at the grocery store, bickering at birthday parties, and setting their own rules with mom and dad. But how do you combat this problem at home while still building your child’s confidence and self-esteem? 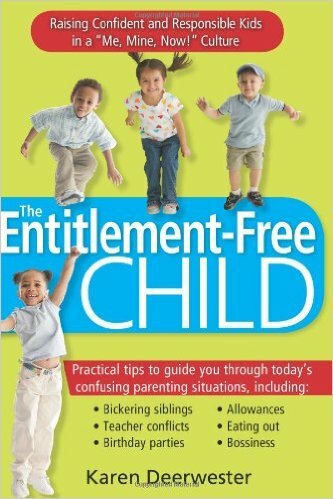 The Entitlement-Free Child is every parent’s answer to raising children in an entitlement world. This book explains how we got here and how to move away from entitlement behavior. It explains how entitlement thinking (Me! Mine! Now!) is based on the fear and the panic that there won’t be “enough” for me if I don’t get it all now. It then gives parents effective alternatives to the quick fixes and the short-term solutions of giving-in and buying up. By highlighting the entitlement or entitlement-free messages in everyday parenting situations, The Entitlement-Free Child shows parents how to meet a child’s genuine needs while teaching respect and appreciation for others. This is the parenting book for the “new economy”. Parents can no longer say “yes” to everything their children want and the old ways of trying to make kids happy by over-indulging them doesn’t fit anymore (not that over-indulgence ever “worked”). With new limits on spending and cracks in the protective bubble, parents need new parenting strategies. Parents also need some reassuring hand-holding that everything is going to be all right. This book accomplishes both. beg for new toys and then discard them quickly? focus more on quantity than on the actual object? lose things haphazardly and never miss them? know how to handle objects with care? grow bored quickly with what she has? measure her things against what others have? place more emphasis on things than on people? If you answered yes to these questions, your child may be overindulged.